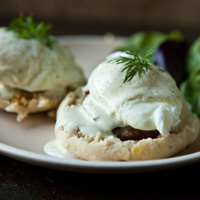 Don't worry, your eggs benedict will always be covered with this foolproof hollandaise sauce. Separate the eggs and add to blender. Add lemon juice, salt, dried mustard, and optional hot sauce. Continue to blend until thick and creamy. Serve immediately.